The Deepwater Horizon oil spill provided a unique opportunity to track the response of the marine microbial community to a massive environmental perturbation, starting within a few weeks after the blowout of the Macondo wellhead began to eject a continuous stream of petroleum hydrocarbons and gases, mostly methane, into the deep water column of the northern Gulf of Mexico (Joye et al. 2011, Reddy et al. 2011). Starting with samples collected during rapid response cruises within the first two weeks of the spill (Diercks et al. 2010), sequencing surveys have mapped the dynamics of the microbial community in the oil-contaminated water column and sea surface (Figure 1), and documented the waxing and waning of methane-oxidizing and oil-degrading bacteria over the summer and fall of 2010 (Redmond and Valentine 2012; Yang et al. 2014, Crespo-Medina et al. 2014; Kleindienst et al. 2016). Here we follow a different tack; instead of relying on 16S rRNA gene or functional gene sequencing to reconstruct the microbial community response in the oil-impacted ocean, samples of weathered surface oil and of the deepwater plume, collected in May 2010, were used in stable-isotope-probing (SIP) experiments to identify oil-degrading bacteria that demonstrably assimilate alkanes and aromatics into their biomass and their DNA. The bacteria that responded were identified by subsequent cultivation (Gutierrez et al. 2013) and by genome reconstruction via metagenome sequencing of the DNA obtained in the SIP experiments, the subject of this study (Dombrowski et al. 2016). Ideally, oil spill responders should be detectable throughout the entire three-fold suite of experimental approaches: in 16S rRNA gene surveys of fresh environmental samples, and in SIP experiments followed up by pure culture isolation and also by genome reconstruction. Some bacteria – for example, the obligate aromatics-degrader Cycloclasticus - reappear consistently in all three approaches, but some are tracked more effectively via genomic reconstruction. Members of the Rhodospirillales (Alphaproteobacteria) appeared consistently in environmental surveys; additional genomes and oil-degrading pathways for specialized members of this cultured marine group could be reconstructed from the SIP samples. The combined SIP and genomics approach indicated that accounting for the presence/absence of bacteria, or their confirmed hydrocarbon abilities in pure culture, does not explain the abilities of the whole community. When aromatics-degrading pathways were reconstructed from the SIP genomes, persistent pathway gaps became evident. Unless these results are explained away by incomplete genome coverage or not-yet recognized pathways, they pose a problem – how can these metabolically crippled bacteria thrive in an environment dominated by petroleum hydrocarbons ? The enrichment of Alkanivorax, previously isolated and studied as an obligate alkane oxidizer, in SIP experiments on aromatic substrates, exemplifies this challenge: this bacterium, which has an incomplete aromatics-degradation pathway, should not survive, much less thrive, under these conditions. Reading the results straight, bacteria with partially incomplete aromatics-degrading pathways, such as Alkanivorax, could potentially form a metabolic network whose members substitute for each other. In this perspective, the successive bacterial blooms following the Deepwater Horizon oil spill indicate not just boom-and-bust episodes of individual bacterial species that respond individually, but suggest the ongoing reorganization of hydrocarbon-utilizing bacterial communities and their interacting metabolic capabilities (Figure 2). 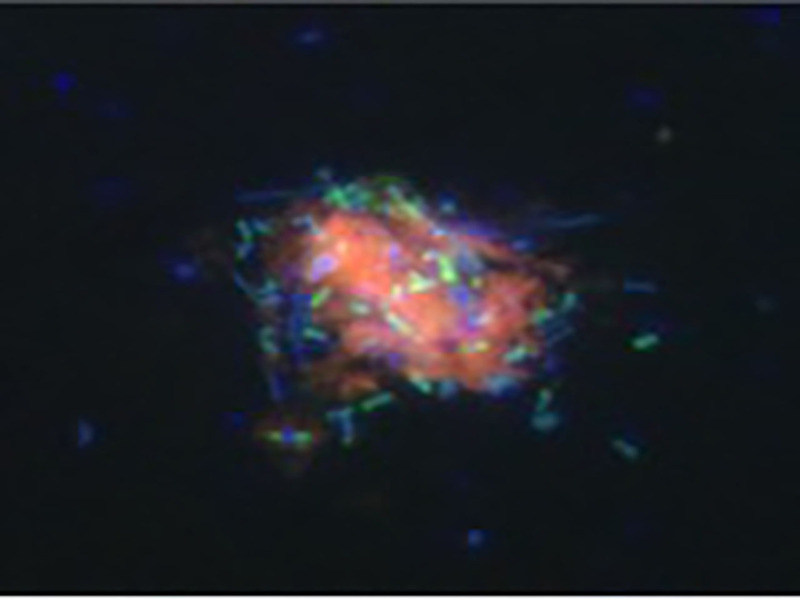 Figure 2: Epifluorescence microphotograph of complex bacterial community associated with pink-colored oil floc in a bottle enrichment with sea surface oil (Photo: Luke McKay, Montana State Univ.). The green cells are stained with a fluorescent gene probe specific for Gammaproteobacteria, the group that contains the majority of cultured, well-studied alkane- and aromatics-degrading bacteria. Other bacteria are stained blue with a general DNA-binding fluorophor (DAPI); although unidentified by the gene probe, they thrive as well in close association with the oil particle and their gammaproteobacterial neighbors. Crespo-Medina M, et al. 2014. The rise and fall of methanotrophy following a deepwater oil-well blowout. Nature Geoscience 7: 423–427. Diercks A-R, et al. 2010. Characterization of subsurface polycyclic aromatic hydrocarbons at the Deepwater Horizon wellhead site. Geophysical Research Letters 37. doi:10.1029/2010GL045046. Gutierrez, T., D. R. Singleton, D. Berry, T. Yang, M. D. Aitken, and A. Teske. 2013. 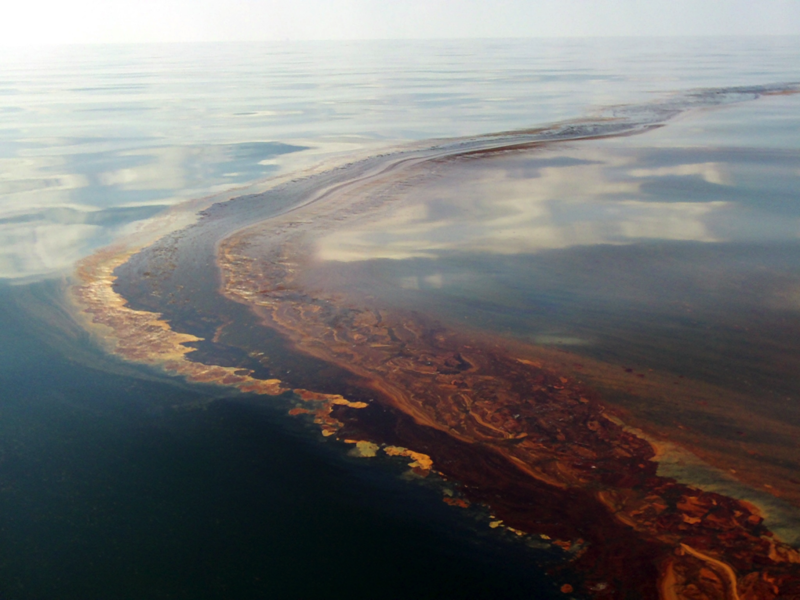 Hydrocarbon-degrading bacteria enriched by the Deepwater Horizon oil spill identified by cultivation and DNA-SIP. The ISME Journal 7:2091-2104. Joye, S.B., MacDonald, I.R., Leifer, I., and Asper, V.A. 2011. Magnitude and oxidation potential of hydrocarbon gases released from the BP oil well blowout. Nature Geoscience 4: 160–164. Kleindienst, S., S. Grim, M. Sogin, A. Braco, M. Crespo-Medina, and S.B. Joye. 2016. Diverse, rare microbial taxa responded to the Deepwater Horizon deep-sea hydrocarbon plume. 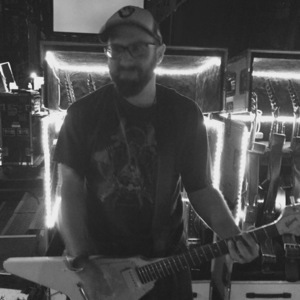 The ISME J. 10:400-415. Reddy, C.M., et al. 2011. Composition and fate of gas and oil released to the water column during the Deepwater Horizon oil spill. Proceedings of the National Academy of Sciences: 109: 20229–20234. Redmond, M.C., and Valentine, D.L. 2012. Natural gas and temperature struc- tured a microbial community response to the Deepwater Horizon oil spill. Proceedings of the National Academy of Sciences 109: 20292–20297. Yang, T., Nigro, L.M., Gutierrez, T., D’Ambrosio, L., Joye, S.B., Highsmith, R., and Teske, A.P. 2014. Pulsed blooms and persistent oil-degrading bacterial popu- lations in the water column during and after the Deepwater Horizon blowout. Deep Sea Research. doi:10.1016/j.dsr2.2014.01.014.